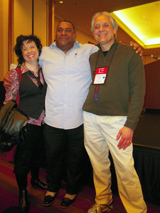 2010 Convention: author Chris Abani, signs books (above) and Convention Chair Carrie Fitzpatrick, Chris Abani, and Immediate Past President Bob Crafton (below). Approximately 1050 members of English honor societies will gather at the Wyndham Grand Pittsburgh Downtown to celebrate culture, language, literature, service, and writing. Registration desk open from 3:00 – 8:00 p.m. Wear your school T-shirt, share your school spirit, and meet others at Wednesday evening’s Opening Ceremony. Listen to our NEHS featured speaker, Jacqueline Woodson. Applaud members as they read works published in The Sigma Tau Delta Rectangle. Meet other convention attendees at the Opening Night Meet-n-Greet, followed by a movie night screening of Dave Egger's screenplay Away We Go, sponsored by Student Leadership and Alumni Epsilon. Learn from ΣΤΔ’s most successful chapters! The Student Representatives and Student Advisors are sponsoring Words Into Action on Thursday morning. The workshop features breakout sessions on important chapter management and student leadership topics. Attend the Chapter Sponsor Workshop on Thursday morning. Discuss issues Sponsors face in fostering chapter involvement, recruiting new members, and developing chapter leaders. This workshop is led by some of Sigma Tau Delta’s most successful Chapter Sponsors. Attend paper and panel presentations. Go to a presentation and book signing by our featured speaker, Lorene Cary. Participate in the (Dry) T-shirt and Skit Competition/Bad Poetry Contest! Cheer and jeer while your peers and professors recreate humiliating childhood scenes, conjure up adolescent turmoil, and expose their wounded hearts! Learn about Art Sanctuary at the Question and Answer Session with Lorene Cary. Attend the Business Meeting and Regional Caucuses—chapters must send a voting delegate to both meetings in order to receive the $200 voting delegate reimbursement ($400 for chapters outside the 48 contiguous states). New! Applaud scholarship and award winners and celebrate chapter and Sponsor anniversaries at the Friday morning Recognition Ceremony. Sponsors attend the Regents and Sponsors Luncheon. Find out what a poet laureate does at the Question and Answer Session with Kay Ryan. Go to the President’s Reception for faculty and alumni. Enjoy our featured speaker, poet Kay Ryan. Go beyond words at Open Microphone night with emcee poet Gary Dop. Work one-on-one with an alumnus or graduate student in the Resume Writing Workshop. Enjoy the food and celebrate excellence at the Red & Black Gala Dinner and Convention Awards. Attend a presentation by featured speaker, Dave Eggers followed by a Question and Answer Session and book signing. If you decide to stay in Pittsburgh for an extra day, many tour options are available. View Pittsburgh City Highlights.